Croquetas is a common tapa or a starter, and there are many varieties; croquettes made from tuna, shrimp, mushroom, chicken, cheese, etc. Ham Croquettes below, is one of my favorites. Heat the olive oil for the filling in a saucepan. Stir in the what-flour and let it fry without taking color. Beat in milk and stock gradually. Cook over low heat until you have a thick soft sauce. Add parsley and season with salt and pepper. Spread the sauce in a bowl and cover. Let it cool in the fridge for at least 3 hours, preferably over night. When the sauce is firm, spread the the wheat-flour for the coating on a plate, the beaten egg on a second, and the bread crumbs on a third. 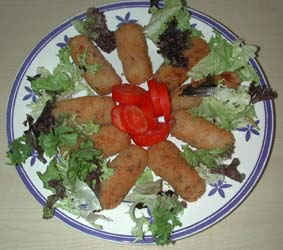 Shape the filling into finger-like croquettes (see photo above). Roll each croquette first in flour, then in the egg and finally in the bread crumbs Make sure that all surface is well coated. Add plenty of oil in a deep-frying pan or skillet. The oil should cover the croquettes. When oil is hot, slip in the croquettes, not to many at the time. Fry them until crisp and golden. Drain on paper towel and serve immediately.